It all started with a catalog in the mail from a major yarn supplier. 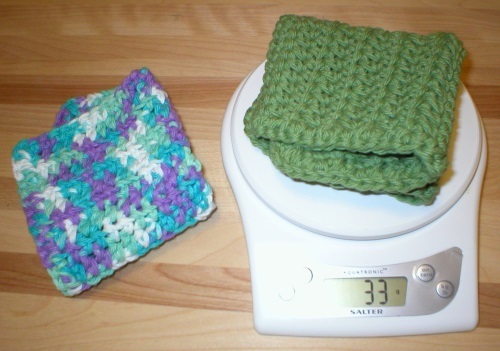 I’ve been making (and selling) crochet dishcloths, facial scrubbies and dish scrubbies to sell locally and online. I usually purchase cotton yarn locally, whatever and wherever I can find it. Living in a very small town forces me to travel to buy practically anything, so my local choices have been rather limited. I make my share of online purchases, but I strive to buy locally first, if I can. As I scanned through the catalog I noticed Premier brand cotton blend yarn (85% cotton, 15% polyester). I had never heard of this brand of yarn before. After reading numerous VERY positive reviews about it, I decided to give it a try. It was on sale with the yarn supplier, so I placed a sizable order. The box arrived yesterday. 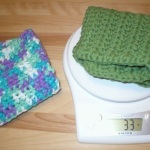 I finished a crochet dishcloth this morning and was SO impressed I decided to share an extensive evaluation of the yarn. Easy to work with and soft. First of all, right away I noticed the yarn was much softer to work with than the usual cotton yarn I’ve used all along. It slides easily on the crochet hook and in my hands. It FEELS much softer than the other cotton yarn I’ve been using. The softness alone makes me believe it would make a nicer facial scrubbie…doing the job well while being even more gentle on the skin. More flexible. 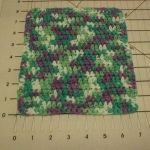 While crocheting, I noticed the dishcloth had more “swing” to it, swaying around as I was making it. The usual cotton yarn makes a somewhat stiff cloth, whether I’m working in a double crochet stitch or half-double crochet stitch. Size. My finished cloth (worked in a half-double crochet stitch, and bordered by one row of single crochet) measured about 8-1/2″ high x 7-1/2″ wide, the same size as my cloths worked in traditional cotton yarn. Weight. 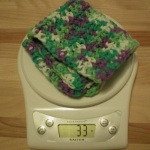 The weight came out to be the same as my traditional cotton cloths, 33 grams. This is important to me because it tells me how many cloths I should get from a skein. The Premier Home cotton small skeins of variegated yarn have 60 grams (2.1 ounces) of yarn, meaning I can get one dishcloth per skein. No worries, as I can make facial scrubbies with the rest, or combine it with yarn from a second skein of the same color to make more dishcloths. The skeins of the other cotton variegated yarn I’ve used have 2.0 ounces (slightly less). Note also that the small skeins of the Premier solid color yarn have 2.8 ounces (80 grams) whereas the small skeins of the other cotton yarn I’ve used have 2.5 ounces (70.9 grams). The slightly more yarn in the Premier skein is a bonus to me, as more yarn equals more product. 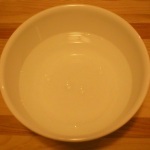 No color loss in hot water!!!!! Color fastness. No color loss–no embarrassment. I was TOTALLY impressed here. 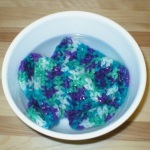 I placed my finished washcloth in a bowl of hot water. There was absolutely no color loss! Doing that with a freshly made cloth in my traditional cotton yarn would result in a major color loss. In fact, I’ve turned to giving my customers instructions on how to set the color in their dishcloths and scrubbies BEFORE they ever use them. Not setting the color with that yarn results in dingy looking cloths after only one use. Even though it’s not a reflection on ME, it’s still a source of embarrassment to have to hand out such instructions. 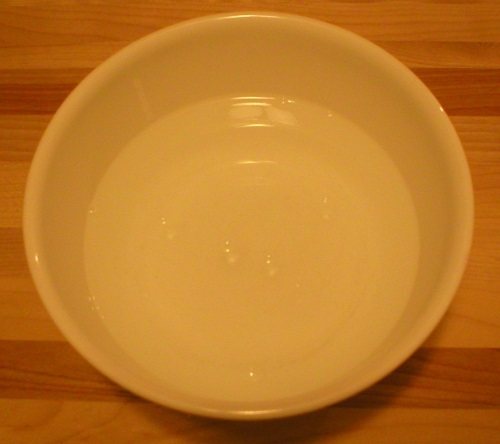 As you can see, the water had NO color to it when the dishcloth was removed from the bowl. YES!! To me, a product should look nice after being used and hold up well without the customer needing to do anything special to it before it’s used. The Premier cotton yarn meets that need, hands down. Way to go, Premier! Washing dishes. Next I washed dishes with the new cloth. It was flexible, soft and very easy to use. It didn’t feel overly bulky in my hands and was easy to wash whatever I needed, from silverware to glasses, to pots. Also, it was very easy to wring out–not overly dense or thick feeling. Removing excess water from the cloth was no struggle at all. Machine drying. After washing the dishes, I rinsed the cloth very well and placed it in the dryer with a damp bath towel. After all, I’ve found that clothes and such dry much better with a little company in the dryer. It dried easily and looked nice and fresh afterward. No dinginess or “worn” look like the traditional cotton dishcloths have after being washed and dried. Furthermore, it maintained its softness and flexibility. Nice! Shrinkage. I measured the cloth after being dried and noticed it shrank about 1/4″ to 3/8″ in both directions. I consider this to be normal, and about what the traditional cotton cloths would shrink. No issues with that. Conclusion. After my evaluation of the cloth made with Premier’s home cotton yarn, I can honestly say I’m extremely impressed. With that, I’m sold! I have no intention of ever buying the other cotton yarn again. 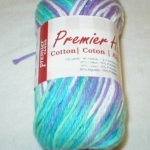 I will finish using what I have on hand and will purchase only Premier’s cotton yarns in the future. To me, the color fastness alone is reason enough to continue with the Premier yarn. However, the other properties such as flexibility, softness and ease of use (from crocheting to washing dishes) makes it a far superior choice for me. 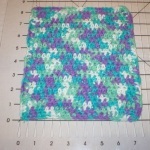 This entry was posted in Crochet, Misc and tagged evaluate premier cotton yarn, premier cotton blend yarn, review of premier cotton blend yarn, review of Premier Home Cotton Yarn, review of Premier yarn on October 8, 2014 by Judi. I love this yarn! I buy it from CRAFTSY.com for .95 cents a bundle of 140yards. I made a very large queen sized knited Afghan with it! It came out amazing and washed and dried easy in my machines with no color loss and very very little shrinkage. The Afghan is the best cuddlable blanket ever. My mother in law wants me to make her one. I just ordered 48 more bundles of the awesome stuff costing me $49 total to make another extra large queen sized Afghan. Can’t be that price on that size! Thanks for commenting! I too love this yarn, especially for my dishcloths. For crocheting the cloths, I FAR prefer it over all cotton. Much softer to use and easier to work with. Thanks for the tip on craftsy.com! 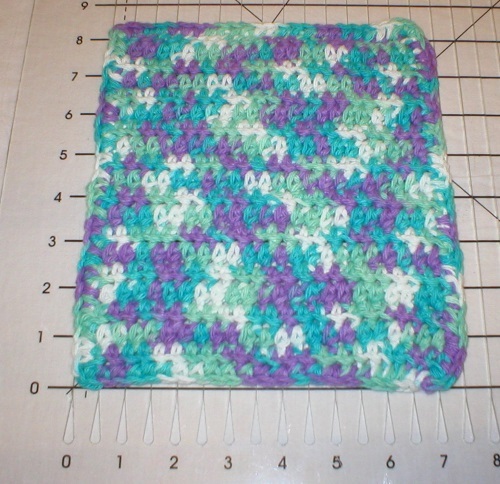 I love the cotton poly blend for dish cloths, so much more durable and retain their color and do not stretch out og shape. I am sold on premier. Thank YOU for commenting! I’m glad this was helpful to you.